o resolve issue of swimming pool safety, we put forward Swimming Pool Net. These nets are braided by making use of supreme quality HDPE ropes while taking into consideration safety of children. The offered nets can prevent small children from falling into pools. Furthermore, to meet divergent demands of the customers, we offer these nets in different colors and sizes. We provide a comprehensible range of Shade Over Swimming Pool, which are manufactured from supreme quality raw materials which ensures our customers of the reliability and durability of our products. These shades ensure complete protection from sun and are easily available in the market. No one likes to swim in a dirty pool, and maintenance often become costly. Mayura shade net can be used as swimming pool covers that keep away leaves from falling in a pool thus reducing algae. It is an economical and much easier way to maintain swimming pool. We are leading Manufacturer of Swimming Pool Shade Net and our product is made up of good quality. 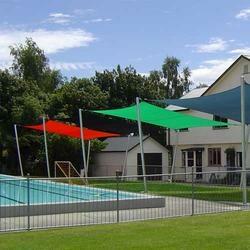 We are one of the prominent company in offering a wide range of Swimming Pool Shade Net in the market. We are one of the foremost firms of Swimming Pool Shade Net. Besides, we present this product at nominal rates to our customers. New invention swimming pool net made from 100% pure nylon rope of 12mm x 8 mm with 3 foot depth, along with blue color single cord HDPE net on it at the bottom with 8 corner ropes of 5 meters long four in the bottom & four on the top, along with floats as per your size. We are the prominent manufacturer and supplier of wide range of swimming pool shade nets that are used in various swimming pools as to avoid uv rays in swimming pools. These are manufactured using high quality raw material and are widely demanded in many markets. 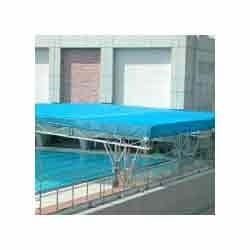 We trade these swimming pool shade nets in various specifications as per the need of clients.